Honoring the huge demands of our clients, we have decided to extend the Christmas and New Year discount offer on web design and development till 19th January 2016. Our offer attracted great response from the clients globally and this has prompted us to plan an extension to the offer. You will now be able to enjoy the same benefits of the offer for an extended period and save big on website design and development. 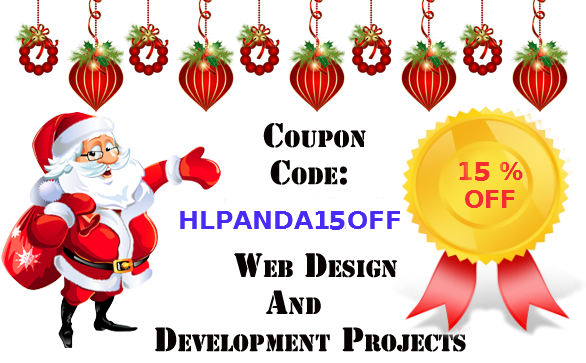 There is a flat discount of 15% across the services offered by HTMLPanda, which is applicable for all the users whether new or existing. Everyone wishes the festivity to last longer and we have just made an attempt to do that. You can save a considerable amount of resource while going for the offer and get an unmatched web design and development service by HTMLPanda in return. The extended offer is exactly similar to the original one and is aimed to offer our clients an experience that none can offer. The response we received for the offer is quite heartening and we are more than happy to announce the extension of the offer till 19th Jan.
HTMLPanda has always enjoyed a great reputation in mobile app and web development industry and earned accolades from the clients. The extended offer can be enjoyed on these services. Web Development: The service includes PSD to HTML/XHTML/HTML5 conversion with an assurance of pixel-perfect and W3C validated markups. PSD to Responsive: Your PSD design layouts are converted into responsive websites with pixel perfect resolution that is rendered well on all devices. Mobile App Development: HTMLPanda also offers hybrid and web app development using technologies and platforms like Sencha and Titanium. Email Conversion: The email conversion service subsumes both desktop and responsive email conversion for a better business reach. This is an offer that does not come by every now and then. We have extended this lucrative discount offer till 19th January honoring your demand and your inordinate response.